Wake up and smell the daffodils. It’s March and that means daffodils…and lots of them! 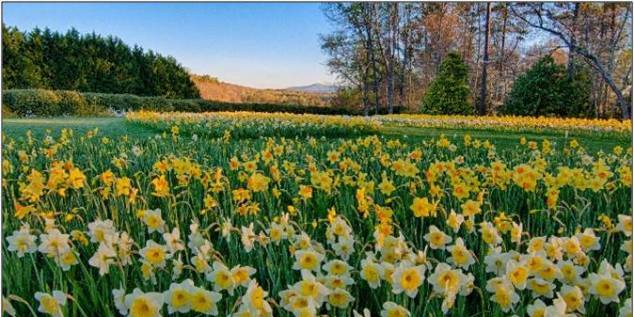 Load the kids up, pack the car, and be ready to have the ultimate “wow” moment when you experience the largest display of daffodils in the United States at Gibbs Gardens. From early March to mid-April, this stunning display includes over 20 million daffodils with more than 100 different varieties that range in color from yellow, cream, primrose, orange, and white. Want the full effect from beginning to end? Plan to visit every weekend to see the early, mid, and late blooming of this breathtaking display. You can experience more than just the daffodils with other spring highlights that include forsythia, quince, and spiraea. All these beautiful blooms are accompanied by white dogwoods and flowering cherry trees. Best of all, this incredible garden destination is only minutes from Big Canoe. No matter the time of year, there is always something to see at Gibbs Gardens…so hit the road and smell the flowers!